“The Mountain and Horse Project,” which is organized by a close-knit community in the Okada area of Matsumoto, will be welcoming all visitors to their fun event at Yamato Ranch on the 13th of April. 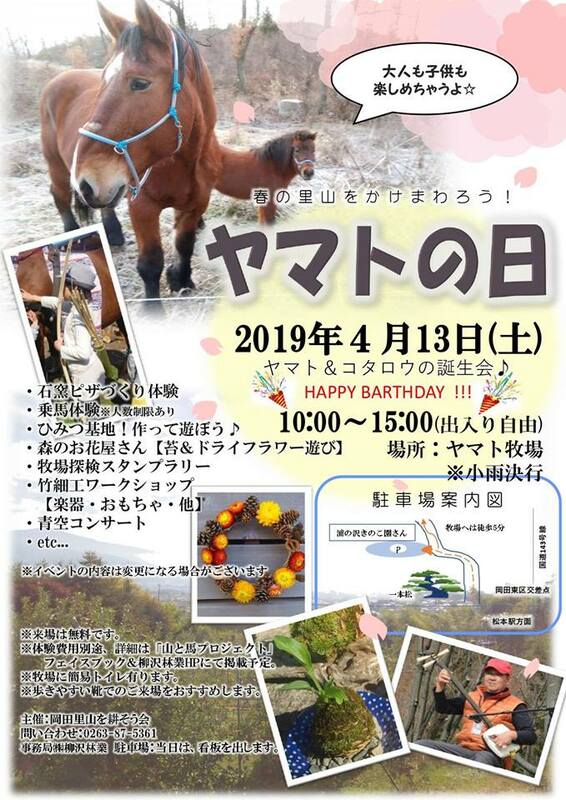 This outdoor event "Yamato no Hi" (Yamato Day) is also a birthday party for two lovely horses, Yamato & Kotaro, who usually work and are being trained at the ranch. Have a lot of fun by trying out making pizza, bamboo crafts, horse riding and watching an open-air musical concert. No reservation is required. Copyright © 2019 Tourism Area Development Committee. All Rights Reserved.